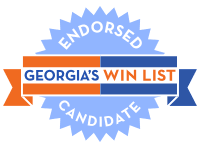 Georgia’s WIN List is proud to endorse Sally Harrell for Senate District 40. Sally is a progressive leader, an unrelenting advocate for her community, and a powerful voice which women, children, and minorities can count on. Having dedicated her life to public service, Sally has the unique experience and influence to help build bridges in the Georgia Senate and bring attention to issues that are commonly overlooked. With her service in the Georgia House of Representatives from 1999 – 2005, Sally is one of the most experienced candidates running for election this year. Prior to serving in the legislature, Sally served as the Executive Director of the Healthy Mothers, Healthy Babies Coalition of Georgia. She holds a Master of Social Work from the University of Georgia and a Bachelors from Georgia State University. During Sally’s tenure in the Georgia House of Representatives, she championed a wide range of women and children’s healthcare issues, advocated for access to mental health services, and fought for mandatory school recess for children. As the first representative to bear children during her term, Sally brought her newborn along with her during the session. Leading by example not only educated her colleagues on the realities and challenges women face in the workforce, but it also led to the successful passage of the breastfeeding bill. 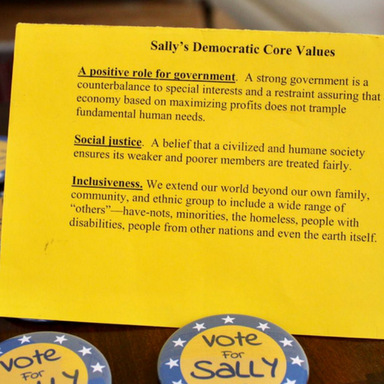 When Sally served in the Georgia House of Representatives, she carried a yellow card of “Democratic Core Values” with her to guide all of her legislative decisions. On this card, she outlined three requirements in which every piece of legislation must meet in order to get her vote: a positive role for government, social justice, and inclusiveness. Sally continues to live by these values today and intends to carry the same yellow card of values with her when she’s elected as Senator. Sally has broken through barriers and paved the way for women in the state of Georgia. She has used her voice to advocate relentlessly for children and minorities. We are proud to endorse Sally Harrell for Senate District 40 because we know that she will continue to be the advocate and voice Georgia needs. To follow Sally’s activities more closely, make a donation or volunteer, please contact the Sally Harrell for Georgia Senate District 40 campaign directly at any of the options below. Georgia women like Sally are making history in this midterm election cycle as they run for seats long held by Republicans. With women in record numbers on the ballot this year, WIN List needs your help to elect these women and train the candidates we want to see on the ballot in 2020 and beyond.